The Irish fight for independence is one of the most captivating tales of the twentieth century. Morgan Llywelyn, the acclaimed historical writer of books like Lion of Ireland, Bard and The Horse Goddess, is the writer born to bring this epic battle to life. Having created an entire body of work chronicling the Celts and Ireland, she now turns to recent Irish history to create a multivolume saga: The Irish Century. 1921 tells the story of the Irish War of Independence and the heartbreaking civil war that followed. Henry Mooney, a reporter for theClare Champion and the Irish Bulletin, is a self-described "moderate nationalist" who struggles to see the truth in the news of the day, and to report it fairly. Lacking more radical Republican beliefs of his dear friends Ned Halloran and Sile Duffy, Henry reports the political--and later, bloody--actions of his fellow Irishman from the ashes of the failed 1916 Rising to the creation of the Irish Free State to the tragic and wide-ranging battles of the Irish Civil War. Meanwhile, Henry feels the impact of these history-changing events in his own personal life. His friendship with Ned falters when their political beliefs diverge, and an unexpected tragedy leaves them further apart than ever. Henry struggles with his passion for a well-bred Protestant Anglo-Irish woman, Ella Rutledge, and as he dutifully reports the events in the political battle for independence, he comes to realize that the Irish struggle for freedom wil leave no life untouched--and no Irish citizen with a dry eye or an untroubled heart. 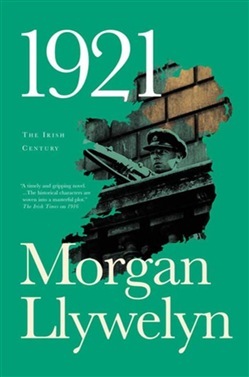 The Irish Century Novels 1916: A Novel of the Irish Rebellion 1921: The Great Novel of the Irish Civil War 1949: A Novel of the Irish Free State 1972: A Novel of Ireland's Unfinished Revolution 1999: A Novel of the Celtic Tiger and the Search for Peace At the Publisher's request, this title is being sold without Digital Rights Management Software (DRM) applied. Acquista 1921 in Epub: dopo aver letto l’ebook 1921 di Morgan Llywelyn ti invitiamo a lasciarci una Recensione qui sotto: sarà utile agli utenti che non abbiano ancora letto questo libro e che vogliano avere delle opinioni altrui. L’opinione su di un libro è molto soggettiva e per questo leggere eventuali recensioni negative non ci dovrà frenare dall’acquisto, anzi dovrà spingerci ad acquistare il libro in fretta per poter dire la nostra ed eventualmente smentire quanto commentato da altri, contribuendo ad arricchire più possibile i commenti e dare sempre più spunti di confronto al pubblico online.